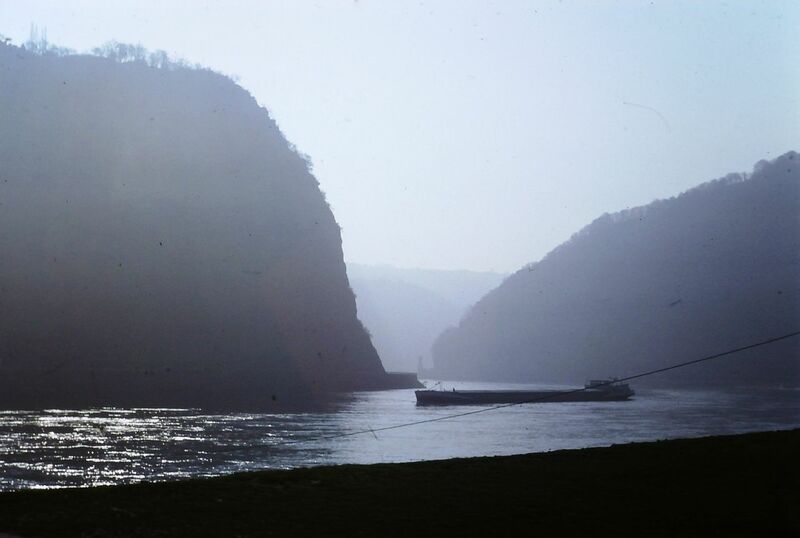 The Rhine river above SCP-2278's source. In site containment of SCP-2278 has been approved as of 21/6/1996. All standard regulations pertaining to the Genius Loci protocol apply. Remote monitoring of the containment perimeter is to follow the protocol guidelines for low threat anomalies. Direct inspection of the cave's soundproofing is to be conducted twice a year; maintenance access to the underground chamber where SCP-2278-A resides requires standard diving equipment, a 5 g ingot of fine gold and active sound-canceling headphones. Communication efforts to skew popular representation of the local legends towards their less threatening versions are to be made and periodically evaluated. SCP-2278 is a cognitohazardous sound pattern originating from a cave at 50° 08′ 22″ N, 7° 43′ 44″ E near the town of Sankt Goarshausen in Germany. The place had been known for centuries as the location of a peculiar echo, but only attracted wide attention from the early 19th century onwards. Cognitohazardous effects are not tied to the original source of the sound and recordings are equally hazardous. However, testing has shown filtering out the 6-8 kHz band renders both direct exposure and recordings innocuous, which indicates the cognitohazard is most likely tied to a pattern of harmonics in that band. The following excerpt was recorded during the first scheduled maintenance of the containment perimeter. It is representative of current SCP-2278 activity. Cognitohazardous harmonics in the 6-8 kHz band have been scrubbed, making it safe to listen to. In the closest areas accessible to the public, sound pressure averaged 35 dB before soundproofing of the cave and was not easily distinguished from other background noise. Exposure to SCP-2278 in those conditions was mildly cognitohazardous, causing disorientation and uneasiness, as well as suicidal ideation in depressed subjects. Such effects were only temporary, disappearing when perception of the pattern was discontinued. Cognitohazardous effects at ground level stopped after the cave was soundproofed in 1996. Direct exposure to SCP-2278 in the cave itself causes more pronounced effects, the most notable being catatonia and a significant perceptual time dilation. After-effects can last for several months, manifesting as dysthymia or low-grade clinical melancholy. Sound pressure at the source is variable but routinely reaches 130 dB, making it a direct physical hazard. The anomalous nature of SCP-2278 was not discovered until advances in statistical analysis revealed a higher than average mortality rate in the area. Several drownings and barge wreckings first thought to be accidental have since been re-qualified. The signal's source itself was serendipitously identified during an investigation into the disappearance of several divers in the immediate area. After contact with Agent L██████ was lost, his beacon kept emitting from a location inside the rock. The retrieval team found no access to the beacon's location until Agent D██████ accessed a previously unseen underwater tunnel. Later testing showed the entrance appears as an impenetrable rocky talus to anyone not carrying gold. Both Agent L██████ and Agent D██████ wore gold signet rings. After a short sump, the entrance tunnel leads into an irregularly shaped underground hall, 47 m (l) x 23 m (w) x 27 m (h) in its largest dimensions. Most of the hall is occupied by the carcass of a creature, laying in pooled red water, from which the anomalous sound pattern emanates. The carcass, designated SCP-2278-A, resembles that of a specimen of Balaenoptera musculus in an advanced state of decay. It possesses several features reminiscent of Homo sapiens : misshapen arms and legs, a mane of fine blonde hair and a human-like, feminine face. Necropsy of SCP-2278-A has shown an aberrant genetic makeup with only passable correspondences with B. musculus and H. sapiens genomes. The analyzed tissue is heavily contaminated by organic pollutants: organophosphates, dinitro-ortho-cresol, endosulfan, mercury ethoxyethyl-hydroxyde, dyes and other compounds. This contaminant profile matches both that of the red water found in the cave and of the 1986 Schweizerhalle chemical spill. 37 human bodies were recovered from the cave, in various states of decay. Autopsy of the freshest ones indicate death from exposure and dehydration. Unconsumed supplies were recovered, lending credence to the hypothesis that direct SCP-2278 exposure causes a deep and acute form of melancholia. None of the recovered artifacts were older than the second quarter of the 19th century. Given the touristic nature of the site, non-destructive extraction of SCP-2278-A is not feasible. In situ containment, tentative Euclid classification and application of the Genius Loci protocol were requested on 11/5/1996 and subsequently approved. ISO 7010-W003 signage is installed underwater near the entrance to discourage access. A secure airlock was built to restrict access through the tunnel. The main hall was soundproofed with 50 cm of low pressure spray polyurethane foam. Complete and undisturbed. What a lovely para-archeological record. Heine, 1824. Nothing we recovered was much older than the poem. This isn't the first anomaly we find that was created through manifestation of belief. This is, however, the first time we have solid, material proof towards that hypothesis. Only time will tell if the Genius Loci protocol can alter those anomalies just enough to make them non threatening. But this is our perfect test subject.